Horses are mammals, and like all mammals give birth to live offspring who are nourished for the first part of their life by their mother's milk. A mare can only produce one foal per year. A stallion is capable of producing around two hundred foals per year. A mare is capable of producing a foal at about eighteen months of age, but it is healthier for mare and foal if the mare is at least four years old. A stallion can start breeding mares as early as two years (in some cases earlier), but it is healthier for the young stallion if breeding does not begin until four years. In both cases, early breeding may affect growth. A mare may continue carrying foals until they are in their late twenties. A stallion may continue breeding mares into his twenties, although his potency will decline. Foals can walk and run a few hours after birth. They may nibble grass, concentrate or hay within a few days after birth, although their mother’s milk will be the main source of nutrition. They may be weaned from their mothers as early as three months after birth, although many breeders choose to leave mares and foals together longer. Although feral horses mate and give birth without the attention of a veterinarian, many problems can be circumvented by having the stallion checked before breeding, and mare checked and cared for properly during the gestation period. The gestation period is approximately 340 days or 11 months. Some mares will be inclined to foal earlier or later than the average, and breeders will get to know these tendencies. In a natural environment, the stallion will breed the mare in the summer, and foals will be born in spring and early summer. This ensures that the foals are born when pasture is abundant, and the weather has become less harsh. If a mare gives birth earlier—during the late winter months, for example, the foal will be born with a thicker coat, but still, need indoor protection from the frigid weather. Mares are generally more receptive to stallions during the late spring and summer months, although they may have oestrus cycles approximately every three weeks, year round. However, breeders who wish to manipulate the breeding cycle, so foals are born earlier in the year (most commonly race horses) will use lights to simulate the longer days of spring and summer. The artificial daylight stimulates the mare's reproductive hormones, and they can be bred earlier and in turn, will foal earlier in the year. Beyond the absence of an oestrus cycle, mares may not show any visible signs of pregnancy for the first three months. Pregnancy can be confirmed by ultrasound after approximately two weeks after the breeding took place. Blood and urine testing can be done two to three months after conception. Alternatively, a veterinarian may be able to manually feel changes in the mare's uterus approximately six weeks into the pregnancy. It's important to have the mare checked by a veterinarian early in the pregnancy for her health and the health of her foal. Horse twins are rare but can lead to the mare aborting. If the twin foals are carried to term, there is a possibility of losing both. For this reason, it's often recommended to 'pinch off' one embryo. This is done very early in pregnancy. It's not unusual for a mare to lose a pregnancy, so it's recommended to ultra-sound, blood or urine test again after about three months. Things like checking how a mare shakes its head, the look in her eyes or which way a needle moves when held over her belly are not accurate methods of determining if she is in foal. After about three months the foal will be developing rapidly and start to look like a small horse. After about six months, the mare may start to be visibly pregnant. Mares that have foaled before may show an expanding belly sooner than a maiden mare. Over the remaining months, the mare's belly will continue to grow as the foal approaches its foaling date. About two weeks before the due date, the mare's udder will start to expand and start producing sticky yellowish fluid. After about 315 days of pregnancy, the mare will start to show signs of foaling. The yellowish fluid will turn into the first milk or colostrum. The udder may drip, and the muscles around her tail head may become more relaxed. Her belly may appear to drop, as the foal positions for birth. At this point, birth is imminent, and the mare must be checked frequently for signs of foaling. Shortly before birth the mare will appear restless, may paw the ground and check her sides (similar to colic symptoms). She should be stalled in a large, clean stall, preferably ​bedded with straw. The mare may lie down and get up repeatedly and may give birth standing or lying down. First, the amniotic sac may be visible, and then the foal's front hooves and nose. The foal is normally birthed within a few minutes at this stage. Occasionally, a foal is 'breech' or hindquarters first, or one or both forelimbs may be bent back. Sometimes the mare foal is injured during the birth process or has other issues that require professional attention. 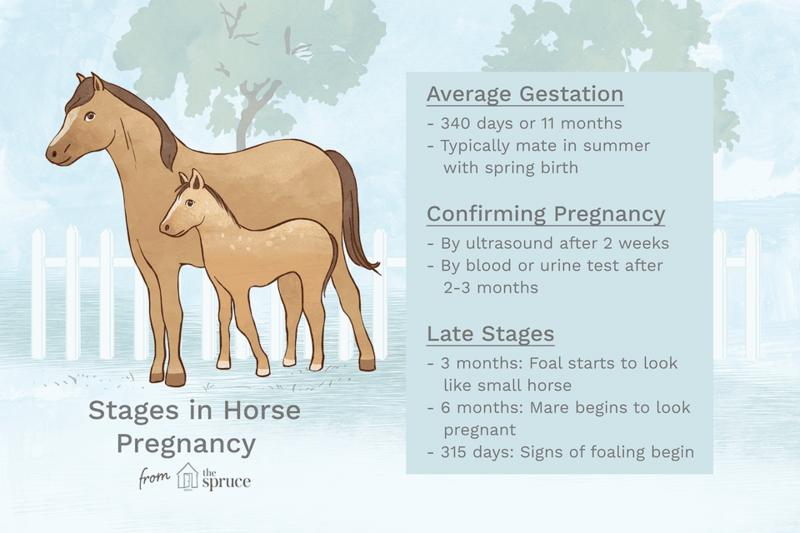 Your veterinarian should check mare and foal carefully shortly after the foal has arrived.